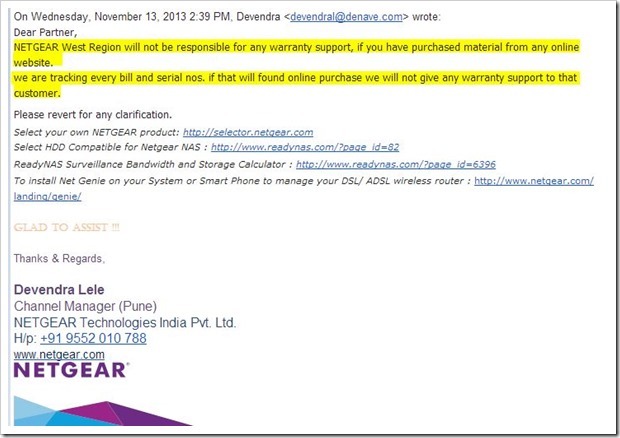 In November last year, we had published a post on how product manufacturers like Netgear are refusing to offer warranty on products purchased from online ecommerce sites. It seems Netgear (and previously Nikon) are not the only ones who seem to be doing it. Consumers buying products online need to keep this in mind before making their purchases from any online website. This is true especially in the case of high-priced items like Laptops, Digital SLRs, mobiles etc. Last year Nikon had also posted a message on their website that Flipkart and Snapdeal are not their authorized partners/dealers and products purchased from these stores may not be eligible for warranty. A Netgear channel partner recently got this email from the manufacturers’ channel manager stating exactly the same in case of Netgear products. While Toshiba has not mentioned it explicitly on their website, according to this news, Toshiba has warned consumers against buying their products online saying that none of them are authorized to sell its products, including Televisions and Laptops, online. According to the news, Toshiba will be circulating this message to all the newspapers and have put up the disclaimer in websites and Televisions. In last 24 months or so, online shopping grown to such an extent that offline retailers are now severely affected by them. Their sales are down as consumers prefer to buy products online, thanks to excellent deals offered by the likes of Flipkart, Snapdeal and Amazon. Obviously, hundreds are offline retailers and channel partners are revolting back stating that they cannot match the prices offered by these online retailers. In addition to this, these channel partners double up service agents. So, consumers are buying the products online, but approach these offline retailers/channel partners when it comes to warranty servicing. They hardly make any money on servicing of products that are in warranty period. Lenovo’s own Thedostore lists Lenovo P780 phone for Rs. 18,869, while the price of the same phone on Flipkart is over Rs. 1500 lesser. 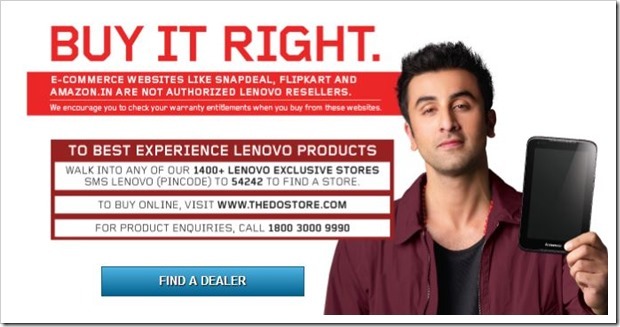 Obviously, a consumer prefers to buy the phone from Flipkart rather than from Lenovo store! Offline retailers have also come together to form an association called “We Will Act” to protest against the price undercutting done by ecommerce sites in India. In our view, more product manufacturers may come forward and officially warn consumers against buying online. Will I get warranty/guarantee card for Lenovo Y50 because I’m planning to purchase it online? Thats against consumers not against flipkart and snapdeal.if i am a online buyer that thing will harm me not flipkart,snapdeal or amazon.i think people should not buy products of those brands which are against customers. I think what companies are doing here is to protect its customers against any suspected fraud. Do note that none of these so-called online-retailers stock these products. They sell it through registered resellers who many a time defraud on product performance and warranty. Their websites are full of such user ratings where-in they think they are buying a genuine product, but all they get is a cheap product with the brand logo sticker on it. Many consumers have also complained about how a product packaging is missing contents or how it develops a malfunction within the warranty period. But these online sellers do not take any responsibility for any such claims made by the customers. They send them to these companies’ customer care centre. Firstly, it would only be fair on the companies’ part to make their customers aware of who their authorised sellers are and who are not. It’s an advisory, for which companies should be applauded as they take a risk of irking online resellers and curbing their sales numbers. But they put their customers’ interest first. Such notices are not unprecedented. Almost every company has such an advisory on their websites, to protect their customers against unsuspecting purchases. Check out the ‘Awareness Notice’ issues by LG, to its customers – http://www.lg.com/in/about-lg/…. But thats what all this is, just an awareness notice. Afteral, internet defraud is something that is completely unheard of and unseen. Isn’t it. I do not believe that not offering warranty is a solution to the problem. Instead the brands should insist and contract with e-commerce websites that they should be allowed to sell directly in a marketplace model or give e-commerce websites a list of channel partners who are authorized to sell online. If this approach is accepted, neither the devaluation of the product will happen nor the channel partners will lose out on market share. If the prices are controlled by the manufacturers or authorized channel partners, physical stores will be able to match the online prices when the customer requests for. Being in hospitality industry and my exposure to revenue management I understand the importance and have learnt how to control the prices floated in a market. In hospitality industry – Airlines as well as Hotels have a system called Best Available Rates (BAR). The brand has the full control over what price is being floated in the market and ensures that rate parity is maintained across direct selling rates, agent selling rates and online travel rates. However, what I do not understand is that, now Flipkart and other major e-commerce sites work on marketplace model where retailers or re sellers upload products and prices. How are small time re sellers able to sell less than cost price ?